TORONTO - Prince Philip wrapped up a brief visit to Canada Saturday by awarding a new regimental flag at a Toronto military ceremony that saw parachutists spiral through in the sky and rappel teams race down the side of a building. A crowd of several hundred people gathered on the front lawn of the Ontario legislature to watch the Queen's husband present the ceremonial flag, known as the regimental colours, to the Third Battalion of the Royal Canadian Regiment. 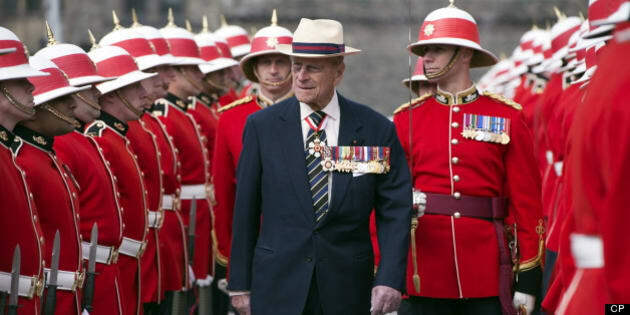 "Your record is impeccable, whether at home or in deployment abroad," the Duke Of Edinburgh, 91, told the dozens of troops assembled in front of him. "In a world where there is so much senseless violence, the regiment has an enviable reputation for peacekeeping." Philip inspected rows of soldiers dressed in crisp red uniforms, and watched closely as teams deployed a belt-fed machine gun and a C-16 grenade launcher as part of the ceremonial exercises. The prince has served as the Royal Canadian Regiment's colonel-in-chief — an honorary title bestowed on members of the Royal Family — since 1953. He last awarded new colours to the regiment 40 years ago. "I am satisfied that you will cherish these colours as a testimony of past achievements, a memorial to fallen comrades and as a reminder to your duties in the years ahead," he said. Regimental colours are considered the most prized possession of every regiment. The festivities began with a dramatic display of the battalion's skills as a pair of soldiers jumped from a plane above the legislature and swooped downward into a nearby field, before a rappel squad emerged on the roof of a nearby building and sped down its side. The flag awarding was followed by a military parade and ceremony marking the 200th anniversary of the Battle of York in the War of 1812. Retired navy chief petty officer Andy Pollock said Philip's presence made the flag event one to remember. "It gives it that extra special touch to presenting a new colour, which is a great honour for the regiment." Peter Carruthers said he admires the prince for coming all the way to Toronto to award the regimental colours. "He's a really stand up guy and I think he represented himself and the regiment really well. I thought it was a superb ceremony." A day earlier, Philip had been on the receiving end of a pair of special honours. Gov. Gen. David Johnston awarded him with the Order of Canada and the Order of Military Merit on Friday. Philip is scheduled to end his two-day trip to Canada with a flight back to England on Saturday night.